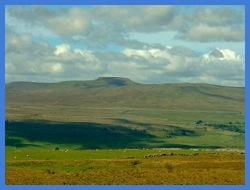 My first of the Yorkshire Dales Three Peaks - Pen-y-ghent from Horton In Ribblesdale. 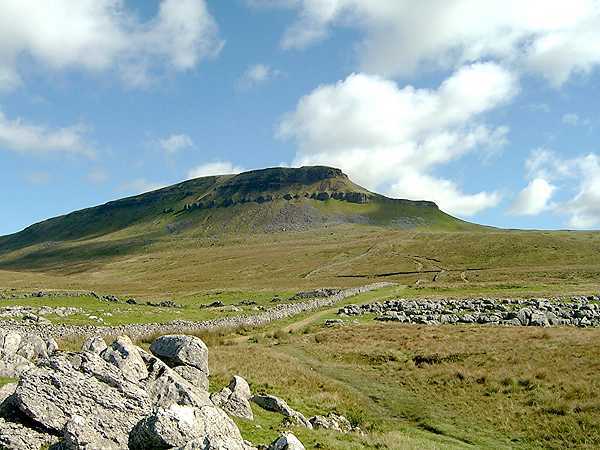 Unlike the previous day and our ascent of Great Knoutberry Hill, the 15th proved to be a beautiful day and at 11 o’clock, Anne and I were in the main car park in Horton in Ribblesdale preparing for the challenge of Pen-y-ghent, which, at 694 metres in height. 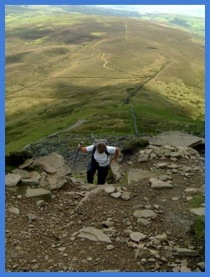 If you are interested in the Three Peaks Walk I would recommend a visit to ThreePeaksChallenge.com. 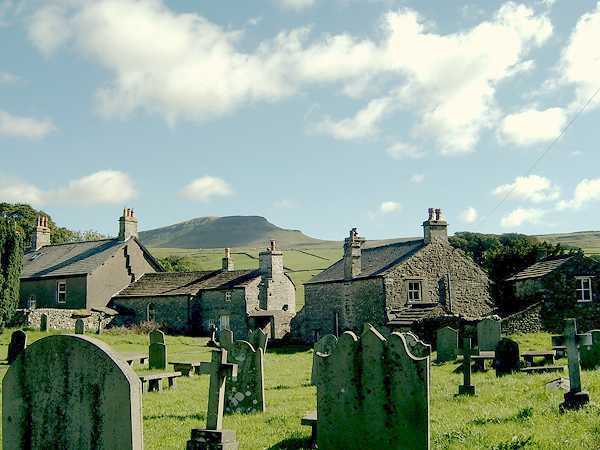 There is a very obvious and pleasant circular route to the top of Pen-y-ghent and back. 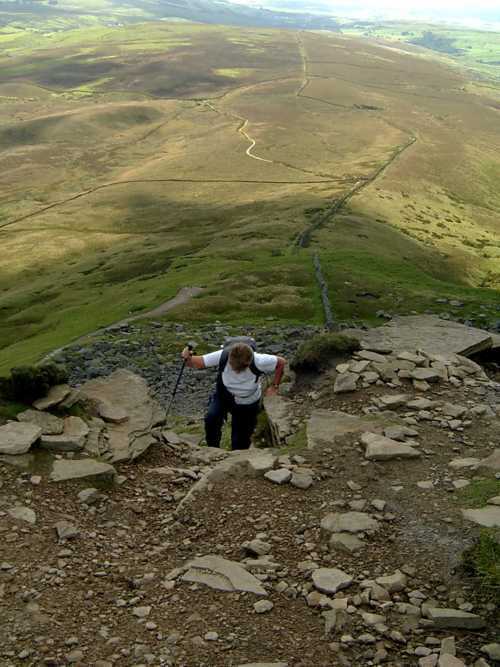 The clockwise route is a more gradual climb but means that when descending from the mountain there is a very tricky downhill scramble to negotiate. In view of this, we decided to tackle the mountain by the anti clockwise route, and we were glad we did. Turning right out of the car park we initially walked south along the main street of Horton, going past the café on the right where walkers attempting to do all the “Three Peaks”, the others being Whernside and Ingleborough, can register for the challenge. We continued past the church and churchyard and, after crossing a bridge over a stream, we turned left up a tarmac road, which further on went past the local primary school. Walking the tarmac was easy, but we left it behind when we reached a sign at Brackenbottom Farm indicating our route to Pen-y-ghent went left off the road and, having crossed a stile, the ascent really started. However, before starting this phase we removed our fleece jackets. It was far hotter than we had anticipated and while doing this a group of female walkers and a lone male walked past us on their journey to the top. The male was soon vanishing into the distance and, although we initially thought that we would be in the slipstream of the female group, we soon overtook them and, although they all looked about 20 years our junior, they were soon left them behind. The route was obvious. 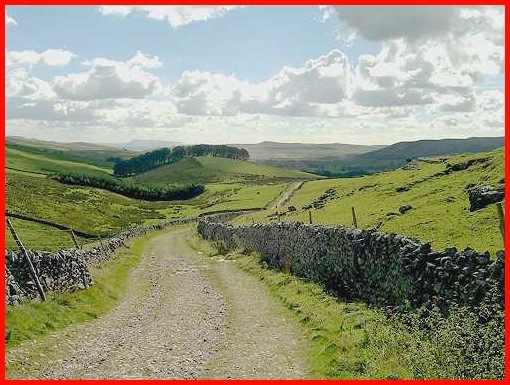 We just followed the path with the wall on our left, a bit like going up Great Knoutberry Hill, but the ground was not covered with peat and was grassy and firm and proved to be easy walking. 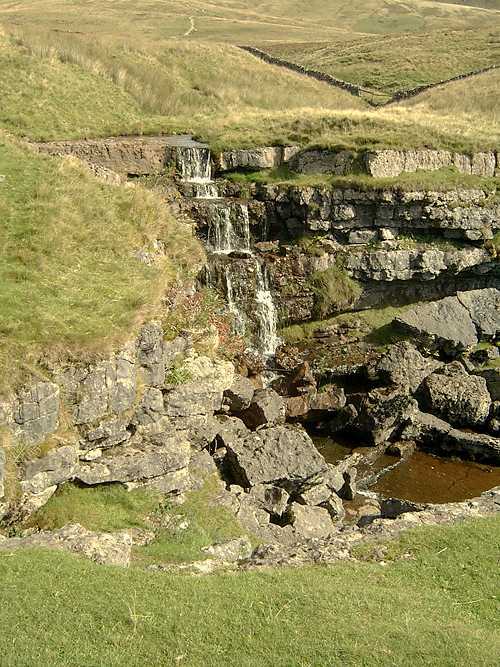 As mentioned earlier it was a beautiful day and the visibility was perfect to admire the Dales scenery. 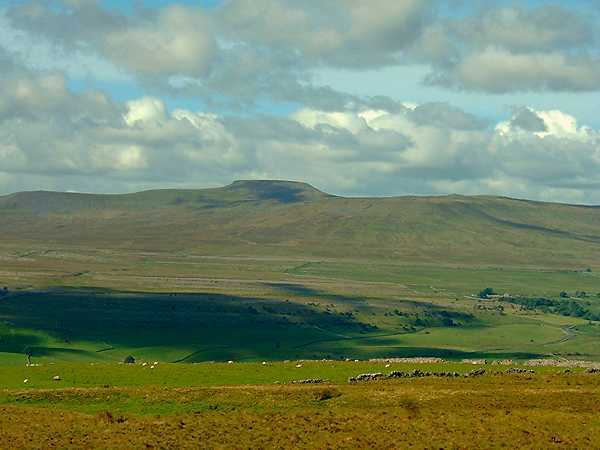 We were able to have good views of Ingleborough on the other side of the valley and, to the north west, we could see the bulk of Whernside and the Ribblesdale Viaduct below it. 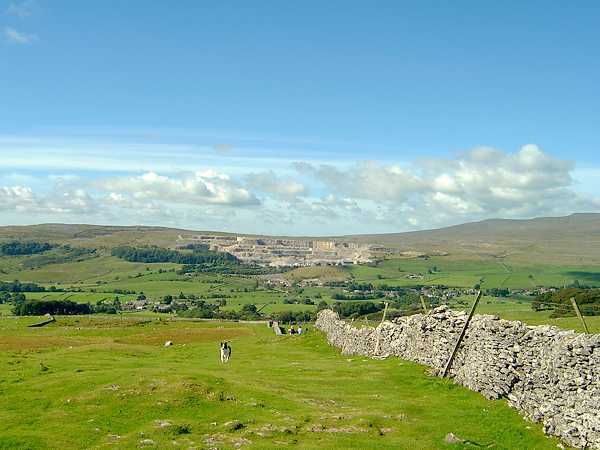 These views certainly made the ascent more enjoyable, although the quarrying on the hillside below Ingleborough was less than impressive. A real blot on the landscape. 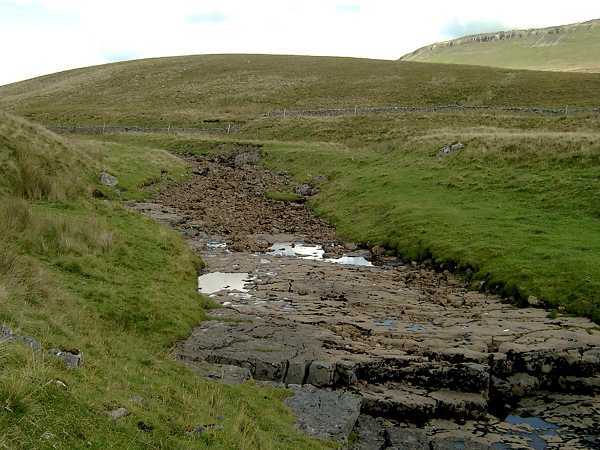 It seemed no time at all before we were under the steep sides of Pen-y-ghent where our path met up with the Pennine Way, which we would follow for the rest of the day and would ultimately return us to our starting point in Horton. 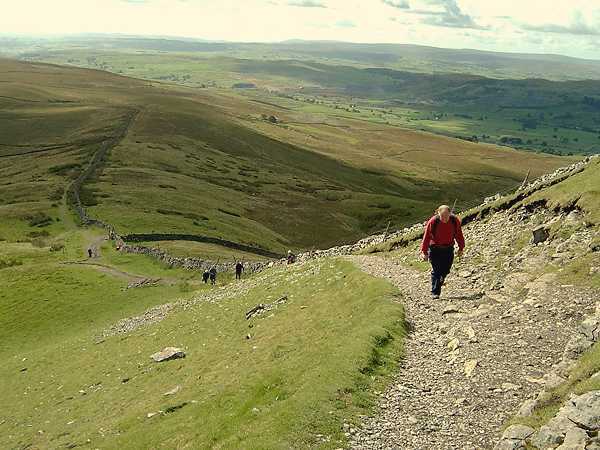 On the Pennine Way, our route immediately got steeper. 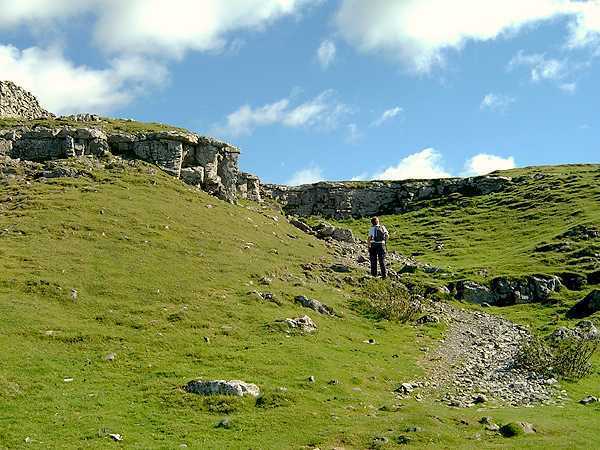 Because of the variable hardness of the different rocks, which make up the last 200 metres or so of this peak, and the these layers have weathered, its steepness is also variable. Initially the gradient is about 30 degrees and was not too difficult, but when a different band of rock was reached, and the gradient become steeper, it resulted in us having to use our hands - a bit of a scramble. On the top of this band, there is a level area before our route continued on a stepped slope of about 45 degrees, before another scramble when the use of hands was essential. It was difficult going up but was certainly a lot more difficult for the walkers descending, which is why we were glad we went up rather than down this path. 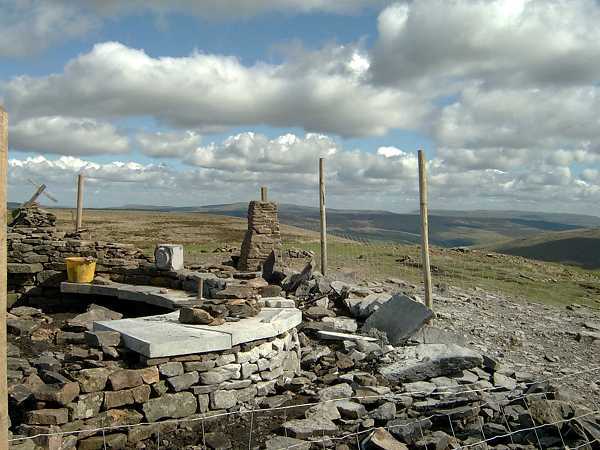 However, once on the top of this last scramble, it is an easy walk to the trig point denoting the top of Pen-y-ghent, which was having a small seating area or something similar constructed adjacent to it. 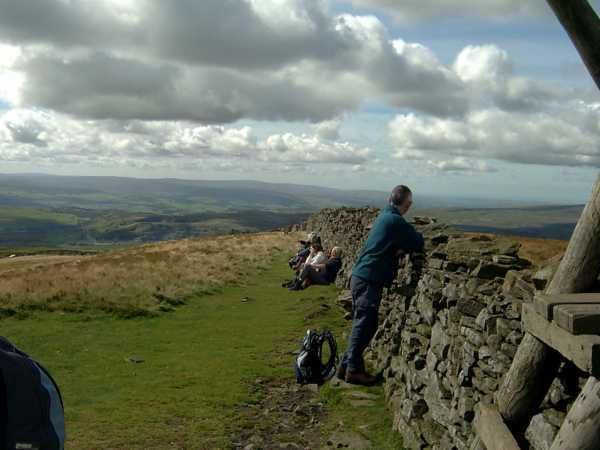 Hopefully this seating will include some type of windbreak as this top is known to be a very windy spot and currently the only shelter is a stone wall, which was being well used as a sheltered picnic spot by other walkers. It had taken us a very pleasant 1¾ hours from leaving our car to reaching the top. Our downhill path went north west before turning north and after a left hand turn in the path we proceeded westwards. The ascent was initially quite steep and I was glad I had a walking pole with me. However, after less than a mile from the top, the path, which was obvious and in good condition, became less steep. 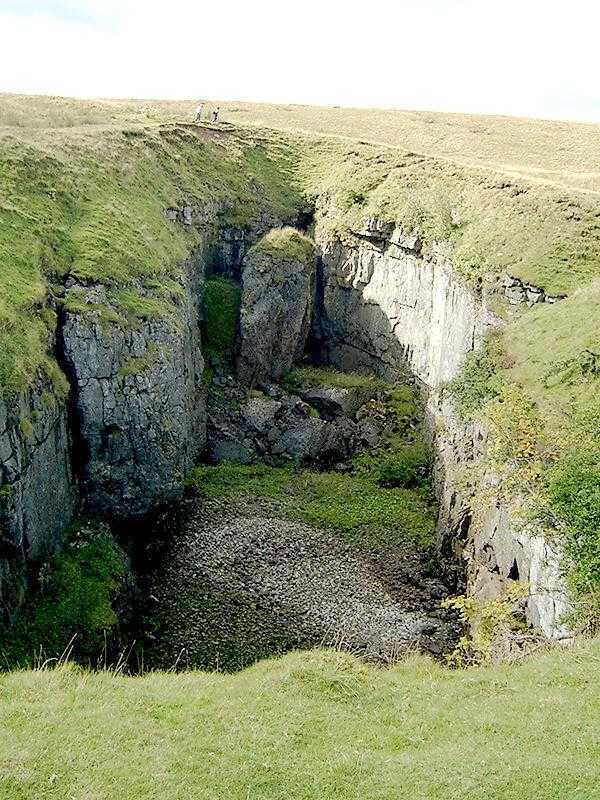 Just off this stretch of the Pennine Way, on our left hand side, was a big hole in the ground called Hunt Pot. 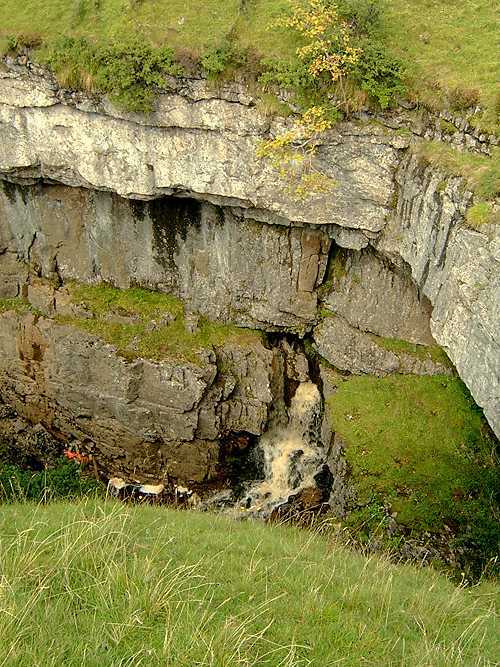 This pothole, like so many others was “manufactured" by the rainwater dissolving the limestone. The rainwater certainly did a good job on Hunt Pot, which I understand is about 200 feet deep and has an underground watercourse going from it that comes to the surface by the Crown Inn, near where we parked our car in Horton. About a ¼ mile further on, at a meeting of paths, our return route did a 90-degree turn left. However, rather than going this way we went 90 degrees right and in 5 minutes came to an even bigger hole in the ground called Hull Pot. This is spectacular and would have been amazing to see immediately after heavy rainfall. The “pot” is fed by both a surface and an underground stream. Today the surface waterway was almost dry, which was a surprise to us after the previous day’s rainfall. 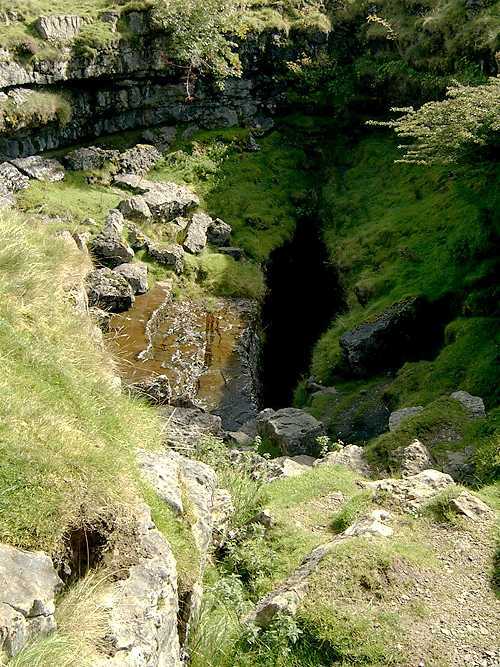 However, the underground stream, which was discharging water into the “pot” via a waterfall, looked impressive. Photographs taken at Hull Pot. To get an idea of the size, note the people in the first and third pictures. 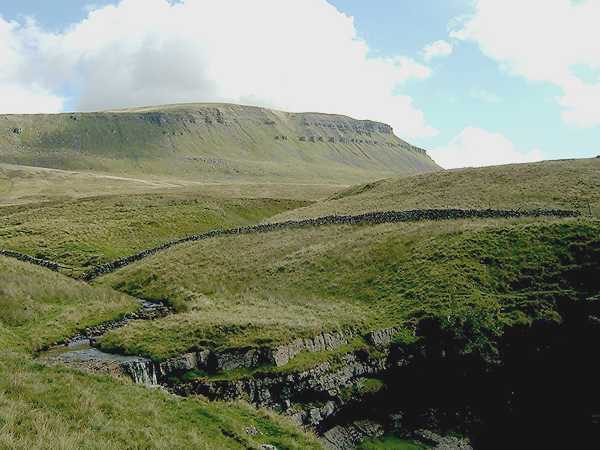 Leaving Hull Pot, we retraced our steps, got back onto the Pennine Way, and enjoyed the views of Pen-y-ghent on our way back to the car. While on this final leg of our walk, we were caught up by the man who had overtaken us earlier in the day by Brackenbottom Farm. We remembered each other from the morning and got into conversation. He had a lovely Yorkshire accent and explained that he was taking advantage of a week off work to do some decorating and walking. As the weather was good, this was a walking day. I asked him if he lived locally and he said “Yes. 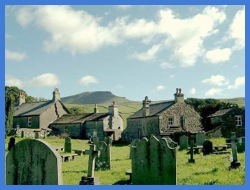 Barnoldswick”. I think this was Anne’s high spot of the day. 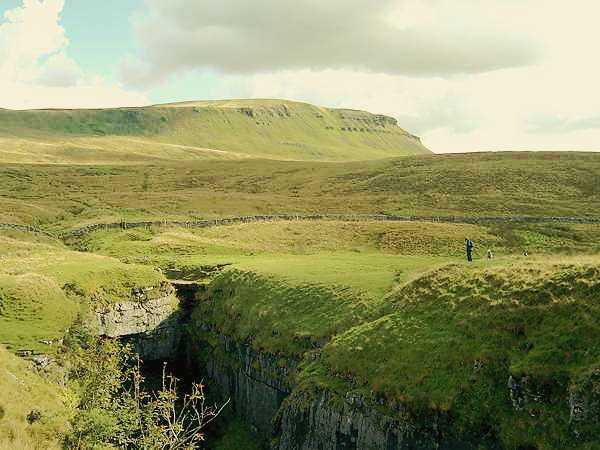 We have often talked about the lovely, and often strange, names of so many Yorkshire and Lancashire places and Barnoldswick, especially when spoken in a Yorkshire accent, is one of Anne’s favorites. 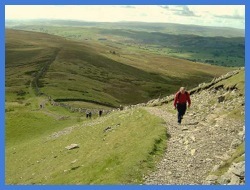 The track - the Pennine Way - back to Horton in Ribblesdale. 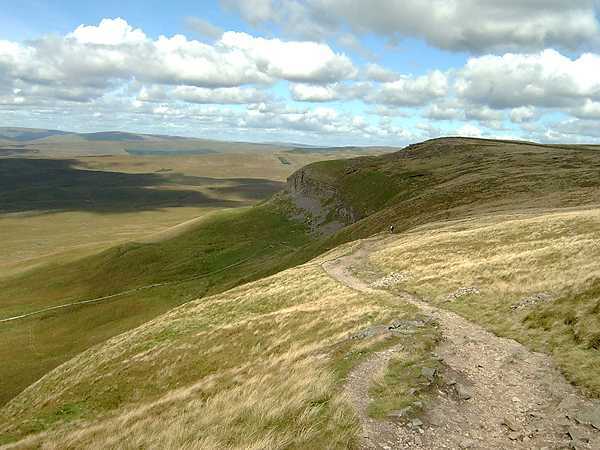 The walk, excluding the diversion, was 6 miles in length; we climbed just over 1500 feet to get to the top of Pen-y-ghent and in total it took just under 4 hours to complete, including all the stops and diversions.